Every time I visit Boston, or more specifically, my home state of Massachusetts, there is one place that I always make sure to visit within the first twenty-four hours of my arrival. I crave a visit to this place so much that as soon as I walk through its doors, I have a strong desire to kiss the ground, although I refrain from doing so due to the staff’s apparent lack of interest in the benefits of vacuuming. But considering that those same staff recognize and welcome me enthusiastically on account of my dozens of visits, I have now come to consider this place to be my second home (not that I have a first home). However, even with that said, I do not intend for the Bombay Cafe to be the focus of this post and truthfully, I have no idea why I even mentioned it in the first place. So let me try to get back on track, although, if you’re at all interested in Indian food, you might want to have a look at TheCurryProject.com, a website (run by Alan from The9to5Alternative.com) that I contribute to every now and then and where I’ll soon be posting my review of the Bombay Cafe! I really wanted this post to be written, not about my favorite place to visit when I return to the region of my youth, but about my second favorite place to visit during these yearly trips. And even though this gem of a destination has nothing to do with Indian cuisine, ever since I ‘discovered’ it for the first time back in 1997, I knew I would be returning over and over again. After all, where else on Earth can one enjoy a beach walk, blueberry scone, eucalyptus, snow angels, a misty meadow, a bonfire, birthday cake, a splash of rain and some apple pie all in the same location? How is this possible? Well, all you need to do is hop in a car, travel two and a half hours west of Boston to the small town of South Deerfield and ask anyone where you can find the Yankee Candle Company’s headquarters and flagship store. Just to give you an idea of how this massive ‘store’ is laid out, I’ll share with you the route that I normally take during my wanderings through the building. And if you can believe it, one complete circuit generally takes me an hour and a half to complete! Starting out in the educational toy section, I proceed through the medieval nutcracker castle, then into the Bavarian Christmas Village. From here, I wander around the elf workshop before visiting the beach cottage, full of seasonally-fragranced candles. And then I move through the New England crafts corner, stopping briefly in the country kitchen, before entering the fascinating mini-candle room, with its rows upon rows of every scent imaginable. After a lengthy look (or smell) around, I make a quick stop at the ‘dip your own candle’ nook before taking a tea and freshly-baked pastry break in the quaint cafe. With energy restored, I move slowly in front of the home-made fudge counter while staying far enough away to prevent me from hopping over the counter and stuffing all of the sweet-smelling fudge into my mouth. I then pass quickly through the less-exciting gifts and collectibles room, with a brief glance at the food section, and then into the sale and clearance corner, which is where the prices suddenly drop for many of the very same candles displayed in other parts of the store. After a bit of wandering up and down the aisles here, and after a few last sniffs of my favorite scents, I finally put my head down, pinch my nose and run straight through the candy store towards the exit, managing only a sloppy wave goodbye to the ever-so-friendly staff wishing me farewell. I rarely buy anything during these visits, as in the end, what is a permanent nomad going to do with a bunch of aromatic candles? But regardless, I’ll trek out to South Deerfield as often as I can in search of refuge from my typically chaotic visits home. Sometimes I just need some scented-candle therapy, is that so wrong? Filling my nostrils with the aromas of freshly cut grass, baby powder, early sunrise, maple pancakes and pineapple cilantro is calming to me and helps me to clear my mind. And perhaps as equally rewarding as the store itself, is the drive from Boston to reach this part of the state. Assuming you avoid the highways, you’ll have a range of excellent country drives to choose from, from the Old Mohawk Trail to the windy, forest-covered Route 122. These slow-going roads will also allow you to visit an endless number of picturesque New England villages and unique sites, including my two personal favorites, the New England Peace Pagoda in the town of Leverett and the Montague Bookmill, an incredible used bookshop set inside of an 1842 gristmill on the banks of the Sawmill River. So, is it so wrong to enjoy scented-candle therapy? 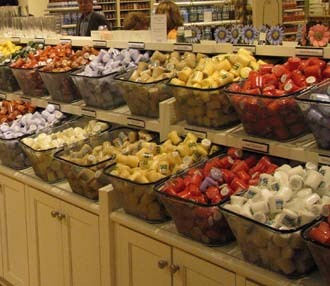 Have you ever been to the Yankee Candle Company flagship store? Or any other place that offers you a perfect, temporary escape? Hey, I’m also from MA, too! I’m not from Boston but I live in a town close to Deerfield and I know that store! Haven’t been there in awhile but I do remember a wonderful Piña Colado candle that I bought which smelled a lot better than I thought. Oddly enough, I haven’t been to the Bombay Cafe although I make regular trips to Boston. And that’s a pity since I have a weakness for Indian food and the ones I’ve been to near me are just so-so. I am from the uk and love Yankee candles I’m more wax tart than the candle as I think the smell is stronger, I’m off to Mexico n wonderd where do they sell them in Mexico as I’m going cancun n know my way I’ll certainly keep my eyes peeled. Hey Mike – You can find them in Cancun….just head to the Plaza Las Americas, the major shopping mall and I believe they sell them at the main shop called Liverpool or at Sanborn’s. .-= Jennifer Barry´s last blog ..Trains- Cars and Funiculars- Getting Around Santiago =-. Hey Jennifer – The holiday scents are quite good, although the problem is that after the first forty-five minutes in the factory, all of the scents begin to mix together. And then I can’t tell the difference between any of them – pumpkin, mountain pine, hazelnut coffee, they all begin to smell the same! .-= Jennifer Barry´s last blog ..Stranger in His Own Land =-. It looks like we are going to have to get ourselves to this Candle Factory, the scents look marvelous! .-= Dave and Deb´s last blog ..Osprey takes flight in Capilano- BC Canada- Snapshot Sunday =-. Hey Dave and Deb – I’m certain you’d enjoy a visit to the factory, especially since it’s in such a beautiful area and not in a shopping mall or main tourist center. It’s definitely a unique experience for anyone passing through the region. .-= Andi´s last blog ..India- Day 5 Part 6 =-. Hey Andi – I certainly debated for a while before finally deciding to go ahead and put this post up! My favorites have always been fresh linen, freshly cut grass and splash of rain. I’m sure you can always order some online to spice up your clinic! So Yankee Candle has infiltrated Mexico! It’s good to know that I can get my fill of scented candles down there as well! I definitely laughed at this one Earl…just because of how true it rang for me. My condo is filled with these candles. In the winter months, my wife and I enjoy the smell of the mistletoe and evergreen fragrances. During fall, it’s the pumpkin spice scented candles and in spring and summer it varies from summery scents of fresh linen, lemon, or some type of flower. Some people hate scented candles, but I love them and just the smell of them does bring back some good memories! .-= Nate´s last blog ..Yoga Poses- Cobra =-. That’s funny Nate. You seem to be quite the candle expert with your seasonal changing of scents! And fresh linen has always been one of my favorites. Glad to see I’m not the only one who enjoys a scented candle every now and then. What can’t you do with scented candles as a traveler? I say get rid of things like “toothpaste” and “underwear” and replace them with the sweet, sweet smells of Yankee Company candles. You’re absolutely right Kyle. There are so many things I could leave behind so that I can always have the scent of Midnight Storm or Christmas Cookies at hand. How handy that would be for my upcoming trip to the Middle East! It’s the little things in life, like Indian food or scented candles, that make the world a better place. Great post, Earl! Are you still around these parts? .-= Alan´s last blog ..New Zealand Circuit- Auckland- New Plymouth- Wellington and Christchurch =-. Hey Alan – I’m actually back in Florida as I’m finally getting closer to my next overseas adventure. Let me know if you have any work trips coming up and perhaps we’ll end up in the same area at some point. That is a truley passionate couple of paragraphs about Bombay Cafe. I can relate to your desire to kiss the ground and everyone in the premesis due to the quality and aroma of the food. Thanks for pointing me towards the CurryProject! .-= Migration Mark´s last blog ..The Stickiest Business in Brunei =-. Way to make me miss home! My mom & dad used to own a candle factory. Later, my mom’s retail chain used to sell Yankee Candles and then when she went into wholesale, she sold stuff TO the Yankee Candle stores. I don’t think I’ve ever been to the South Deerfield store though! Oh, and I’ve never been do the Bombay Cafe either! I’ll definitely check that out when I get back in September. If you’re still in the area, there’s this Vegan Cafe that is an absolute MUST visit about 30 minutes north of Boston in Lowell, MA. Life Alive: https://lifealive.com/ Call ahead, as sometimes they close for unexpected reasons. .-= Raam Dev´s last blog ..Punching my Inner Critic in the Face- An Interview and a New Project =-. Sorry about that Raam! Alhough that’s quite interesting that your parents had those ties to Yankee Candle. I guess you’re more than familiar with their scents as a result. And I would have loved to check out that Vegan Cafe in Lowell. I’m back in Florida now but I’ll put it on the list for next time, or perhaps I’ll meet you there for lunch one day!